Following a report earlier this week claiming that European carriers have been stockpiling new nano-SIM cards in expectation of Apple using the smaller card in the next-generation iPhone, BGR now reports that carriers are indeed testing the new cards in partnership with Apple. Multiple carrier sources have exclusively told BGR that Apple is supplying nano-SIM adapters so its carrier partners can test how nano-SIMs work on their networks in standard test devices before they are widely deployed when the new iPhone is introduced. This includes AT&T. As we noted in the our report earlier this week, a part leak back in early May suggested that Apple would continue to use micro-SIMs in the next-generation iPhone, but with the new nano-SIM standard backed by Apple having been approved last month the company may already be pushing forward to adopt it as a space-saving measure. I understand the need for testing, but isn't a nano SIM just a micro SIM that's been literally cut down? So what exactly is the need for so many carriers to test it as though it's a brand new card? Why does it need to be tested? Isn't it exactly the same as a microsim with less plastic? It makes sense to remove all the unnecessary plastic around it. Eventually all cell phone makers will benefit from the smaller size. I wonder what actually needs testing though. It's standard practice when you introduce anything new into a system. It's a newly manufactured and designed device - anything could go wrong from a design flaw to a manufacturing defect. It's a rumor from BGR. They're about as accurate and credible as Digitimes. Which means the rumor is likely wrong. MacRumors is loathe to admit the credibility track record of its sources. They'd rather just have the page views without making any indication about the possible veracity of their sources. Just read MacRumors as if it were science fiction. Most of the rumors here end up being false, so you should expect this site to be much more fiction than fact. I suspected they would use a cascading card like the one in the picture. So, the stockpiling is just making sure that they have enough SIM regardless which phone will be bought. Since it is going towards Chrismas sales in that quater, it would be foolish to believe that the stockpile is only for the iPhone update. The above system would basically fit in all GSM, right? Good. I never really understood the presence of that useless plastic piece surrounding the actual chip. why not get rid of the sim all together? 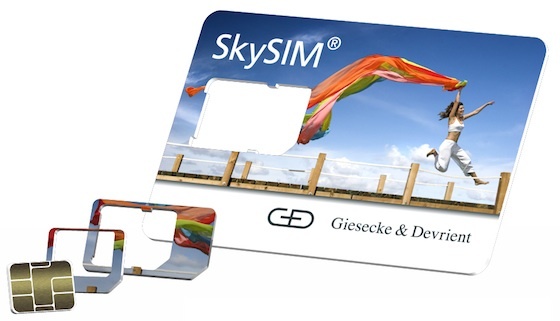 A SIM card is great for consumers. It means that if you buy a phone outright, a carrier can have no say about whether you can use it on their network *just put your SIM card in it and it works. If SIM cards didn't exist, you wouldn't be able to do that, or borrow a friend's phone when your battery is low, or use a foreign network when you're abroad to avoid huge bills, unless you phoned your carrier each time and got their permission. I'm waiting for the Invisa (http://chandaxi.posterous.com/the-ipod-invisa) SIM card. Do they really need to keep delivering the original, full-sized Smart Card form factor? How many phones based on that card layout are still in the wild at this point? Couldn't they save a whole lot of waste plastic if they only mass-produced punch-outs for the form factors that are still widely used?